On the Cover: Bob Denver and Tina Louise (photograph by Ivan Nagy). I was ashamed when I saw the first show. I had studied at the Actors Studio and I’d started to get some interesting roles and some good reviews. I mean like my scene was singled out in Burke’s Law, and there were seven other stars. I only worked on what I wanted to work on in class, things like “Desire Under the Elms.” Finally I realized that I had to start to go back to commercial work. I’d heard about what series are like, but I really didn’t know how it would be. I found that I couldn’t use my work at all in this show. It was quite a shock. In this medium, you perform, everyone performs. There’s no such thing as a real moment, an honest reaction, because the show is like a cartoon. You’re not acting, not the way I studied it. I wouldn’t watch it if I wasn’t on it. Although it’s well-documented that Tina Louise was unhappy with her role on the show, I’m continually amazed to discover just how vocal she was about it at the time. I imagine the set must have been tense at times. To be fair, other members of the cast have concerns as well about the incredible popularity of Gilligan’s Island and its impact on their careers. Natalie Schafer recounts being in New York City in December 1965 and being recognized by the wrong kind of people. “It’s supposed to be very good for your ego to have people recognize you in the street,” she says. “But I look around at the people and I think: ‘Oh, dear, if they were just a little more attractive, I’d like it better. '” Bob Denver doesn’t feel he’s reached his full potential as an actor. Dawn Wells would rather be doing Shakespeare. I dare say Miss Louise will always feel unfulfilled in what she feels are the extents of her talent on the show. I would thing she would be delighted. She’s an integral part of a major hit. What else does an actress want? I don’t know what would make her happy. It seems to me that she’s not a very happy person. I don’t thoroughly understand her. Schwartz is more upset that critics haven’t “reviewed the show from its sociological aspects” and compares it to The Beverly Hillbillies. Neil Hickey’s “‘We interrupt this program…'” is the sort of TV Guide article I like because it really digs into network policies surrounding a particular aspect of television as it existed in the 1960s. President Johnson’s illness in January 1965 and the escalation of the Vietnam War in February 1965 led to huge numbers of news bulletins. The networks circulated memos and reaffirmed policies that bulletins be used only when appropriate but Hickey argues there are no real rules when it comes to interrupting network programming for news bulletins. Sometimes bulletins are plain wrong, as was the case in 1964 when CBS broke in to announce that Nikita Khrushchev was reported dead. It isn’t just the networks. Local stations often break in with reports of plane crashes, for example, without any details which worries everyone who has a relative or friend traveling by air. The heads of all three network news divisions argue that they attempt to do the best they can balancing the public interest of a news bulletin with the public’s interest in watching TV uninterrupted. They also insist that commercials are interrupted by news bulletins, not just programming. Hickey suggests that the networks have finally realized they need to reign in news bulletins due to the “volatile potential in a number of international situations” ranging from the Vietnam War to nuclear proliferation. And there may be help on the way. One of the networks is working on an expensive piece of equipment that will allow news bulletins to be displayed along a strip of letters at the bottom of the TV screen (Hickey notes that while such displays currently exist, they are too slow for bulletins). Another network is considering placing bulletins over the closing credits of a show unless absolutely necessary to avoid interrupting regular programming. Finally, there’s a one page article about actress Sharyn Hillyer, another name I wasn’t familiar with. There’s also a color picture and here, at least, she looks an awful lot like a young Grace Kelly. At 22, she’s best known for playing “everybody’s favorite teen-age girl friend” and has appeared in 11 episodes of The Adventures of Ozzie and Harriett plus a slew of other TV shows. Her husband is 12 years older than her; their baby is about 21 years younger. The “As We See It” editorial this week addresses reaction to March 20th editorial suggesting that sports need to change to become more suitable for television. Sportswriters took issue with that idea. Some, like Dean Eagle of The Louisville Times, were calm about it. Others weren’t. TV Guide reiterated its support for these changes, pointing to the recent CBS telecast of the Masters Golf Tournament as proof and arguing that “television people would be the last ones to seek changes in sport events that would lessen their entertainment value.” If sportswriters have constructive suggestions, they should offer them. There’s no review by Cleveland Amory in this issue. Craig Stevens, General Joe Ross, and the Maharajah of Bundi will hunt tigers in India for ABC’s American Sportsman next season. Ben Casey will open the new season with a five-part storyline starring Marlyn Mason. The National Geographic Society and Wolper Productions will produce four hour-long color specials next season. Rights to long-running radio soap opera One Man’s Family, which already aired on television in two versions, have been purchased by Universal TV. Edward Everett Horton will be a regular on F Troop next season. Bonanza‘s Dan Blocker has become the first actor to win the Silver Spurs Award twice. Irene Ryan of The Beverly Hillbillies commuted between Hollywood and Las Vegas daily while performing in a nightclub, leaving every day 5:15PM and flying back the next morning. Rounding out the national section is a picture feature spotlighting actors on bicycles, a brief essay about The Fifteenth Street School in New York City (founded by actor Orson Bean), and the regular TV crossword puzzle. CBS plans to repeats its Barbra Streisand special. It was unusual for such a young performer to receive their own special [Streisand was 23 at the time]. Re “As We See It’ in your April 24 issue, I shout AMEN! in many decibels, so as to drown out the noise that passes for music on those teen-age wriggle-and-writhe shows like Hullabaloo and Shindig. …it all merely reminds me that we are not as far removed from the jungle and cave as we think we are. 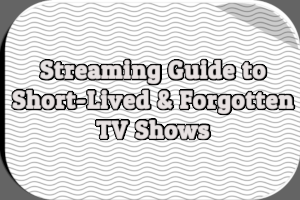 Viewers may still exercise their Freedom of Choice by switching channels. Why find fault with these program that are only a part of growing up? Whoever wrote the article must be 90 years old. Other letters addressed 12 O’clock High being moved to an earlier time in an attempt to draw a younger audience (“What ever happened to adults? Don’t they count any more?”); called Bonanza “just too, too childish for evening entertainment”; corrected Walter Cronkite’s April 19th retelling of the 1939 Marian Anderson/Daughters of the American incident by pointing out that Anderson was only turned away by the DAR because of a Washington, D.C. city ordinance; and wondered if censors will ever allow anything “sexier or more controversial than a support hose commercial” to reach TV. 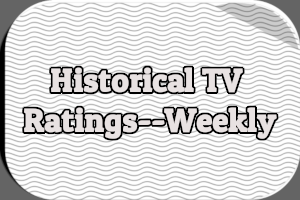 The week was filled with specials, a pair of new show debuts and three shows signing off (two permanently). CBS aired an hour-long special live at 12PM on Saturday, May 8th called “Victory in Europe, 20 Years After” (originally titled “Europe, 20 Years After”) in which General Dwight D. Eisenhower and British Field Marshall Montgomery discussed the Allied victory in Europe during World War II. It was relayed via the Early Bird satellite. At 2PM, ABC aired its weekly baseball game, this time pitting the New York Yankees against the Washington Senators. CBS repeated “Victory in Europe, 20 Years After” at 9PM for viewers in prime time to enjoy. ABC aired the final round of the Colonial National Golf Tournament from 4:30-6PM on Sunday, May 9th. At 5PM, NBC aired “Loyal Opposition,” a half-hour documentary special examining the future of the Republican Party. The final episode of Profiles in Courage (about Senator Thomas Corwin) aired at 6:30PM on NBC. The final episode of For The People aired at 10PM on CBS. ABC pre-empted Voyage to the Bottom of the Sea at 7:30PM on Monday, May 10th to telecast “The Pilgrim Adventure,” the last installment of Saga of Western Man for the season. “The Winging World of Jonathan Winters” aired at 9PM on NBC, pre-empting The Andy Williams Show. It was the last Winters special of the season and guest-starred Steve Allen, Jerry Stiller, Anne Meara, Leo Durocher, Alexander Scourby, and Jack Paar. At 10PM, CBS pre-empted CBS Reports to air “Finlandia,” a tribute to the late Finnish composer Jean Sibelius, taped from an Early Bird relay earlier in the day. Frankie Avalon hosted the season finale of Hullabaloo at 8:30PM on NBC. The same network premiered Cloak of Mystery at 9:30PM on Tuesday, May 11th. 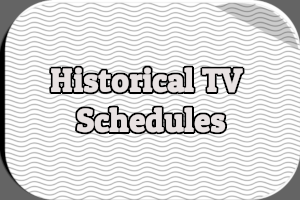 The anthology series consisted entirely of repeats of earlier filmed anthology series. The debut episode was “Don’t You Remember” with Simone Signoret and Lee Marvin, originally broadcast on G.E. Theater. Hoagy Carmichael hosted The Bell Telephone Hour from 10-11PM on NBC, with guests Carol Lawrence, Leslie Uggams, Peter Nero, Bill Hayes, and others. On Friday, May 14th NBC pre-empted The Bob Hope Show at 10PM for “The Man Who Walked in Space,” an NBC News Special about cosmonauts Alexei Leonov and Pavel Belyayev. A second NBC News Special about the dedication of the British memorial to President John F. Kennedy aired at 11:15PM. Jackie Kennedy and Senators Robert F. and Edward M. Kennedy were on hand, as was Caroline Kennedy. Footage of the dedication was taped earlier in the day and flown to the States. Locally, there were plenty of sports and specials this week. At 2PM on Saturday, May 8th WBZ-TV (Channel 4) aired “Science Countdown 1965,” hosted by Norman Macdonald with participants from Massachusetts high schools in Pittsfield, Lee, and Dalton. At 2:15PM, WHDH-TV (Channel 5) aired a baseball game between the Cleveland Indians and the Boston Red Sox. ABC affiliate WTEV (Channel 6) aired “Victory in Europe, 20 Years After” at 6:30PM despite it being a CBS News special, likely because Boston’s WHDH-TV declined to air it at 12PM. WHDH-TV did air the prime time repeat at 9PM, however. Advertisement for ABC’s Saturday Baseball Game of the Week on WTEV (Channel 6) – Copyright 1965 Triangle Publications, Inc.
Advertisement for ABC’s Saturday Baseball Game of the Week on WNAC-TV (Channel 7) – Copyright 1965 Triangle Publications, Inc.
At 1:30PM on Sunday, May 9th both Boston’s WHDH-TV and Providence’s WPRO-TV (Channel 12) aired a baseball game between the Cleveland Indians and the Boston Red Sox. New Haven’s WNHC-TV (Channel 8) aired its own baseball game (New York Yankees vs. Washington Senators) at the same time. WNAC-TV (Channel 7) aired another episode of Esso Repertory Theatre (“The Trojan Women”) at 4PM, followed by FDR at 5PM (which it pre-empted on Friday, May 7th for a movie), so it didn’t carry ABC’s coverage of the Colonial National Invitation golf championship. Boston independent station WIHS-TV (Channel 38) aired the golf tournament instead. At 6:30PM, WPRO-TV aired another installment of syndicated Men in Crisis (“Lindberg vs. The Atlantic: Ordeal by Air”). Edmond O’Brien narrated. 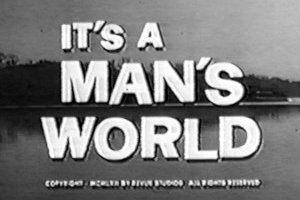 Boston educational station WGBH-TV (Channel 2) aired the first episode of a British documentary series called Men of Our Times at 8PM on Monday, May 10th. The series examined men who have shaped 20th century history. The premiere focused on Adolf Hitler. Future episodes would cover Lenin, Gandhi, King George V, Mussolini, and former British Prime Minister Stanley Baldwin. WHDH-TV pre-empted the CBS special “Finlandia” for a David L. Wolper documentary called “Prelude to War” about the British policy of appeasement prior to World War II. Richard Basehart narrated. Advertisement for The Merv Griffin Show on WBZ-TV (Channel 4) – Copyright 1965 Triangle Publications, Inc.
On Tuesday, May 11th, WGBH-TV aired a live two-hour Boston Pops concert from 8:30-10:30PM. Arthur Fielder conducted. WNHC-TV pre-empted ABC’s prime time line-up for a baseball game between the St. Louis Cardinals and the New York Yankees. It started at 7:55PM. WGBH-TV telecast another college lacrosse game on Thursday, May 13th at 8PM between MIT and Wesleyan. WNHC-TV pre-empted ABC’s Jonny Quest and The Donna Reed Show from 7:30-8:30PM for an hour-log color special about the 12-hour Sebring Sportscar Endurance Race. Chris Economaki and Les Keiter narrated. Special guest Vivian Vance salutes Mental Health Month. The high cost of scholarships is discussed by author Claire Cox. Singers and dancers from England, Thailand, Italy, Japan and Greece perform. The third part in a story telling what goes on in the State House of 24 Beacon Street. Armed Forces Day is observed with a special program from the Army Research Center at Natick. I must say i found Tina Louise’s comments rather surprising. To think that she was not happy with the popularity of Gilligan was just about the last thing anyone would have expected. One could only wonder how any of the other cast members felt about their contributions. Do you think Jim Backus felt the same as Natalie Schafer? Did he also believe the wrong people were recognizing his work? IDK if he felt that way when he was playing Judge Bradley Stevens, Mr. Dithers or even Mr. Magoo. Bob Denver need not have worried about whether or not he had reached his potential as an actor. If he didn’t do it as Gilligan, some might think he did in his days as Maynard G. Krebs on The Many Loves of Dobie Gillis. And if not there then it might have been on the syndicated Dusty’s Trail. The fact is this: even tho critics saw Gilligan’s Island as TV’s ugly duckling, it only took 3 seasons for it to be adored as a beautiful swan by viewers and fans. Never mind his acting, it was his STAR potential that, i think, truly blossomed-despite the one time he was a guest on Password and had the misfortune of the word “Skipper” almost eluding him. Gotta watch them typos, friend. The ABC series was NEVER called “The Voyage to the Bottome of the Sea”. Most often it was just listed as simply “Voyage” in the listings. That WTEV (now WLNE) carried the CBS News special about the 20th anniversary of VE-day was no real surprise. It was common practice back then for certain stations to air programs rejected, or not cleared, by the respective affiliates in that market. For example, take WEWS in Cleveland. They aired Jack Paar’s Tonight show instead of NBC O&O WKYC-TV, which chose to show movies. CBS station WHIO-TV in Dayton, OH carried Flipper which got turned down by WLWD (now WDTN), which was affiliated with ABC, despite its’ then sister stations in Cincinnati and Columbus were with NBC. And longtime NBC station KSNT carried ABC’s 1984 Oscars telecast-only because the ABC station, KTKA got its’ transmitter knocked out by an ice storm which came through Topeka that year. I’m even starting to learn that one ABC station in this edition, Manchester, NH’s WMUR-TV didn’t always stick with them-back in the 50’s, they carried some CBS shows-like their evening newscast when Doug Edwards was the anchor. And then, of course, there’s WBZ-TV, which pre-empted the Johnny Carson Tonight Show in favor of movies-until this week 50 years ago, when Merv’s show premiered. They eventually got that settled. Looking at one of the two ads for baseball games, i see that this time, WTEV decided not to use the outdated ABC eagle logo. Smart move. And it’s nice to see one of the great sports personalities, Chris Schenkel, whom i mostly identify with ABC’s Pro Bowlers Tour as well as Wide World of Sports. What a great team that was-Jackie, Leo and Merle along with Chris. No finer set of commentators could have ever been assembled. Why didn’t WNHC (now WTNH) take note of this? That should have said, “WDTN was with ABC despite the fact their then sister stations in Cincinnati and Columbus were with NBC” And i get after you about typos! Sorry, David. 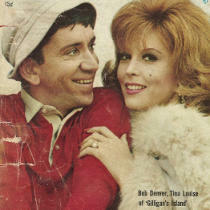 There’s a story behind that cover shot of Bob Denver and Tina Louise. Seems that it was actually a group shot of several GILLIGAN’S regulars; TV GUIDE’s editors decided to crop the shot to just Bob and Tina – neither of whom was precisely enthralled by this. Given the accompanying article – and particularly Tina Louise’s comments within – what was already a tense setside situation didn’t exactly improve (that week, anyway). The Jonathan Winters special included a spot in which Jonathan was sitting at a dinner table, while off to the side, several comedy writers would throw premises at him, so he could improvise. When I saw the show at age 14, I noticed that one of the writers seemed to be twice the size of all the others. This was the legendary (even then) Pat McCormick, whose own on-camera career was still a few years away. On AMERICAN SPORTSMAN, that’s General Joe Foss, war hero and, at the time of the show, the first Commissioner of the American Football League (which, as it happened, had a TV deal with ABC Sports). Are you going to keep this series going during the summer months? Mike, as soon as I saw this cover, I thought about the same thing, and was going to write about it. You beat me to it! I read something by Bob Denver about this cover. It was probably in his book “Gilligan, Maynard & Me.” The photographer wanted to photograph only him and Tina. He did not think that was fair, because he viewed Dawn as important a cast member as Tina. The photographer agreed to his request. When Bob saw the cover that week, he was very unhappy to see that Dawn was cropped out of the picture. If you look closely, you can see a sliver of one of Dawn’s pigtails along the left border. And it was through Denver’s insistence that Wells and Russell Johnson were included in the opening credits (and title song) after the first season. Joe Foss signed the big money deal with NBC for the AFL rights…which brought the league into parity with the NFL and led to to their merger. My plan is to continue A Year in TV Guide through the September 11th, 1965 Fall Preview issue, assuming I can find a copy for a reasonable price. Otherwise, it will end with the September 4th, 1965 issue. 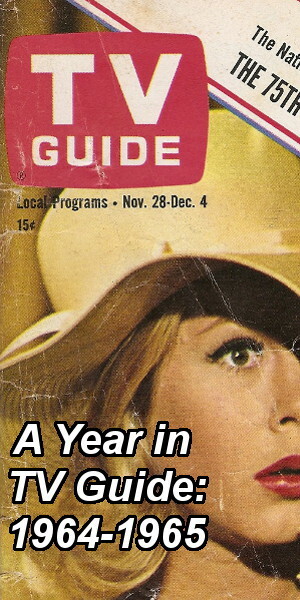 As sorry as I will be to see A Year in TV Guide come to an end, I understand. It has to be a huge amount of work for you each week. Thank you doing it. It is fantastic, and a very clever, creative project. The crawl is born! Thirty years later it becomes a permanent part of TV on some channels because of a person who back in 1965 was a freshman playing football at City College of San Francisco: O.J. Simpson. Great work in reviewing these classic TV Guides. Also cropped out of the cover picture was the ever-present cigarette in Bob Denver’s hand. He died from lung cancer in 2005. It wasn’t just WBZ that pre-empted Johnny Carson for Merv Griffin. Sister station KYW-TV (then in Cleveland; it would move back to Philly a few months later when the FCC ordered Westinghouse and NBC to un-do a swap of stations in those two cities they had made a decade earlier) was also an NBC affiliate which aired Merv instead of Johnny. The reason was that WBZ and KYW parent Group W/Westinghouse was the owner, producer, and distributor of Merv Griffin’s 1965-69 syndicated talk show, and initially, wanted all their stations to run it in late-night. It’s my understanding that when Group W retook ownwrehip of Channel 3 in Philadelphia (which became the new KYW-TV and was also an NBC affiliated station at the time), they continued to run Johnny at 11:30 P.M. and Merv would be seen in the late afternoon. WBZ would follow suit in September, 1966. In the 1960’s, Group W/Westinghouse mounted three syndicated talk/variety shows which it’s own stations would air in late-night (Steve Allen 1962-64; a young Regis Philbin 1964-65, and Merv Griffin after 1965). The company hoped other stations would follow suit, but apart from the Group W stations, most other stations running one or more of those there shows did so in late-afternoon. For instance, David Letterman once recalled that as a “tween”, he would see Steve Allen’s 1962-64 show late in the afternoon after coming home from school. As for WBZ, they dropped “Tonight” in June of 1957, just as Jack Lescoulie was canned as host (and moved back to “The Today Show”, where he had previously been). 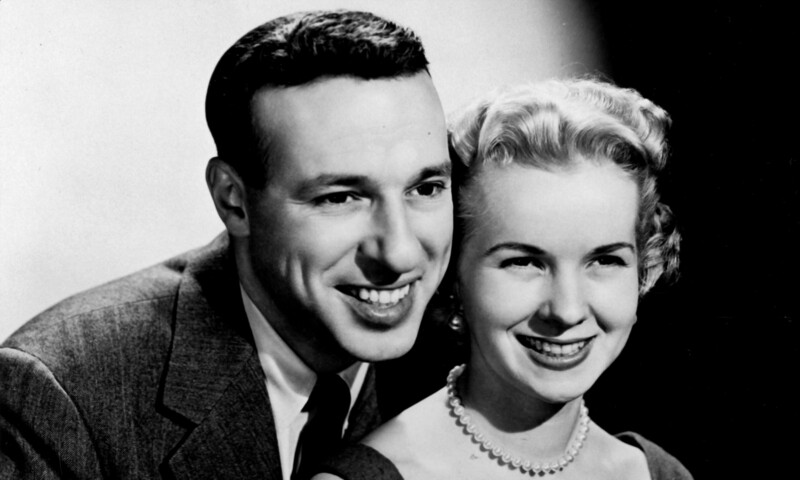 The show, by then called “America After Dark”, limped along with interim host Al “Jazzbo” Collins for about a month before Jack Paar took over. WBZ, as noted above, wouldn’t resume airing the show until 1966.